In “Traveling High and Tripping Hard,” author Joseph Davida takes us along on his journey to find the meaning of life, discovering that doing so in an altered state often gives one the same answer: sometimes there is no direct answer. We all, in the course of our lives ask the same question, yet the answer is different for each individual. Growing up in a small town in Queens-Nassau, Davida found one didn’t have to leave his town to find all the entertainment an 8 year-old would want. Unbeknownst to him while visiting Mike’s Lotto to play a new arcade game with his sometimes friend-enemy, he accidently ingested a piece of bubble gum laced with a high dose of PCP. Thus began his journey of finding the meaning of life. While some readers will find his extensive use of drugs offensive, each of us travel our own journey in a way that works for us individually in order to seek the same answer. From the jungles of Central America to Egypt and Buddhist and Hindu temples, Davida shares the highs and lows of life, loss, and despair, and coming to truth with one’s spirituality. The author has a canny ability to describe the paranoia that comes with the sudden stopping of psychotropic drugs, sharing this experience after a harrowing trip in Vermont. For those who have gone through this, or know someone who has, it will bring back some not so pleasant memories. His writing style is unique in that most of his memories come from a drug-induced state that provide a glimpse of how altered states impact all areas of your life, yet some continue to abuse those same drugs. He is insightful, sarcastic and edgy. 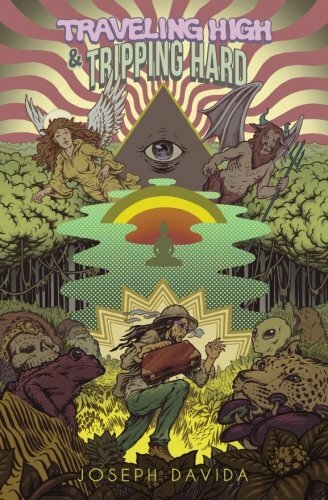 “Traveling High and Tripping Hard” by Joseph Davida is a compelling read. I am sure there are many readers who will connect with the message.